Ross Castle Ireland is near the town of Killarney in a stunning location on the banks of Lough Leane, one of the beautiful lakes of Killarney National Park in the Southwest Region of Ireland. 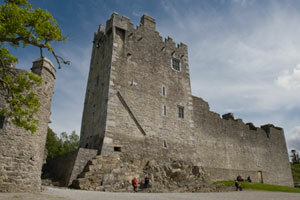 The day I visited Ross Castle was a perfect, sunny day with streaks of clouds in the sky. The photos were beautiful. One of the visitors was enjoying a boat ride on the adjacent lake. 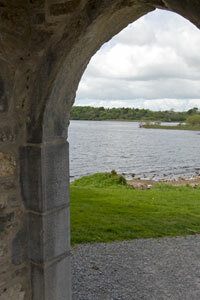 Ross Castle in Ireland is a typical stronghold of an Irish Chieftain of the Middle Ages. 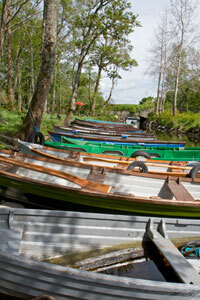 It was built in the late 15th century by one of the O’Donoghue Ross chieftains. It was surrounded by a fortified wall, called a bawn, and circular towers, two of which remain. The castle contains 16th and 17th century furnishings. Its four floors include the great hall, the parlour and the bed chamber. 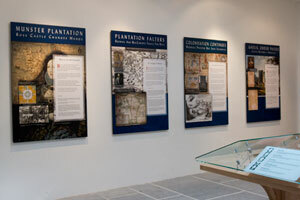 The castle has been nicely restored using traditional medieval construction methods. 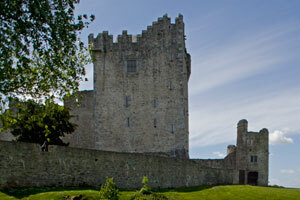 Ross Castle Ireland was the last castle to surrender to the Roundheads during the Cromwellian wars. Legend has it that the spirit of its founding chieftain rises up from the lower lake on a white horse every first day of May! 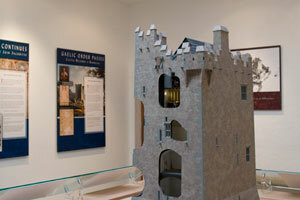 There is a nice display room on the main floor of Ross Castle showing showing the history of the castle using various models and charts. You must take a scheduled tour to see the castle itself. This castle is a very popular site, so you may have a wait during the summer months. 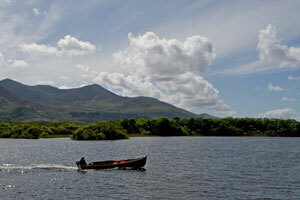 Other popular sites near Ross Castle are Muckross House and Gardens, Muckross Traditional Farms, Killarney National Park and Muckross Friary. 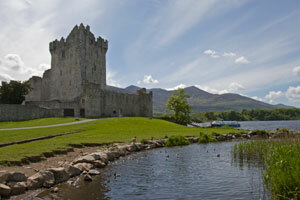 Ross Castle Ireland is found 2 km from the town of Killarney off of N71 (Kenmare Road).